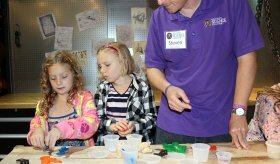 Club members will explore the intersection of Science, Technology, Engineering, Art, and Math during this six week club. The content for each session will be determined by the students’ interests in exploring various scientific concepts and principles. Highlights of this program include, individualized learning goals for each child based on observations made by a science educator and weekly projects and activities that will encourage further exploration at home with you and your family. Students also have exclusive after-hours access to the Science Center – including Jack-O-Lantern Lane with Frankenstein’s Lab in October and the Dino Light Experience in November.